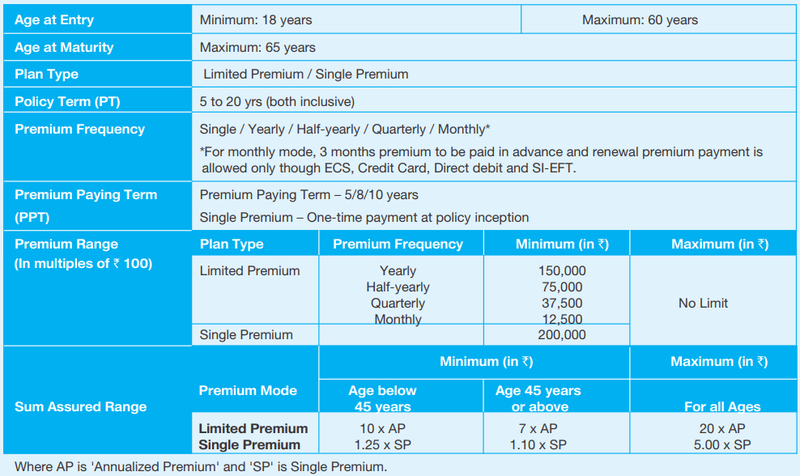 SBI offers seven different types of plans that provide you the option of investing in a wide range of ULIP plans. The joining process for this plan is simple and guarantees additions of around 30% of an annual premium. A medical examination is not required and no premium allocation charge is applicable from 11th year onwards. Once the policy reaches maturity, the fund Value will be paid. To avail the death benefit, higher of the Sum assured or the Fund Value is to be paid. 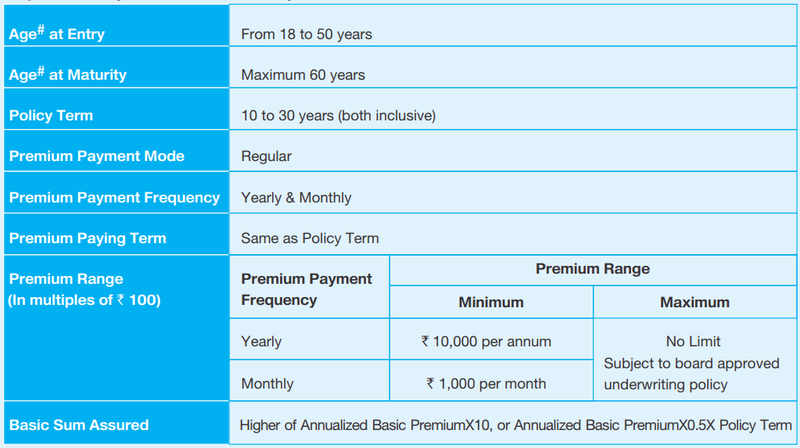 Here, a minimum of 105% of total basic premiums paid till the time of death. Switching of funds is allowed and the option of Partial withdrawal is also available. As an investor, the flexibility to invest in any of the funds – Smart Funds or Trigger Fund, and the two plan options – Level Cover Option and Increasing Cover Option. The policy also offers Death benefits, Maturity benefits, Tax benefits and inbuilt Accelerated Total and Permanent Disability (TPD) Benefit to its investors. Plan Options: Proposer can choose any one, from the below mentioned plan options, at policy inception. Plan option once chosen at policy inception, cannot be changed during the Policy Term. Level Cover Option: The Sum Assured that you had chosen at inception, remains the same throughout the Policy Term. Increasing Cover Option The initial Sum Assured will automatically increase by a simple rate of 10%, starting from the 6th Policy Year and every 5 years thereafter. Mortality charges would then be based on this revised Sum Assured. This feature will be provided to you without any additional underwriting or medicals. On maturity of the Policy, the fund value will be paid. On death of the policyholder, higher of the Fund Value or Sum Assured is to be paid. 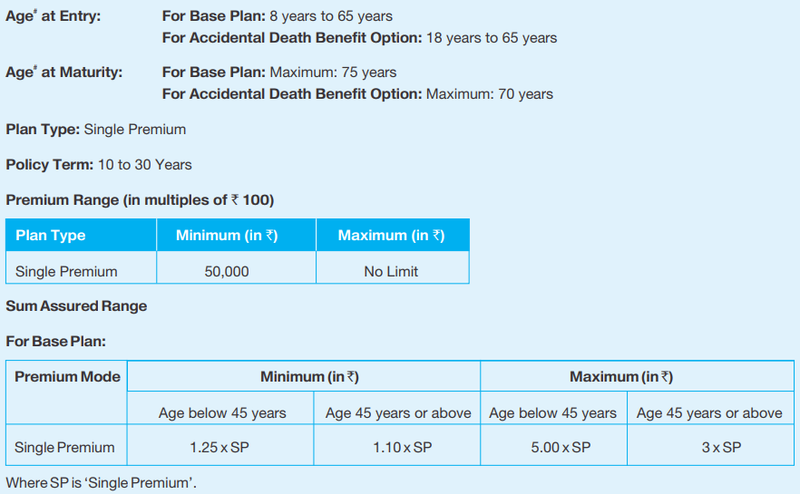 Here, a minimum of 105% of total basic premiums paid till the time of death. Investment is made in Bond fund and equity funds. The flexibility to customize the product with Accidental Death Benefit Option On maturity of the policy, the fund Value will be paid. Death Benefit: Higher of the Fund Value or Sum Assured is payable; with a minimum of 105% of Single premium paid. This unit linked life insurance plan provides life insurance cover along with market-linked returns. Death Benefit: Higher of (Fund Value or Sum Assured or 105% of total premiums paid till date of intimation of death) is payable to the beneficiary. There is a chance that the sum Assured reduces to the extent of partial withdrawals, which have been made in the last 2 years that immediately precede the death of the Life Assured. Partial withdrawals are allowed from 6th year of the policy year or from the age of 18. On maturity of the Policy, the fund value is payable. If the policyholder passes away, then the higher of the Fund Value or Sum Assured is stands payable. Here, a minimum of 105% of total basic premiums paid till the date of intimation of death. Death Benefit: In the Gold Option, fund value or Sum Assured, whichever is higher stands payable. Here, a minimum of 105% of total premiums paid till the time of death. In the Platinum Option, the amount payable is the Fund Value plus Sum Assured. 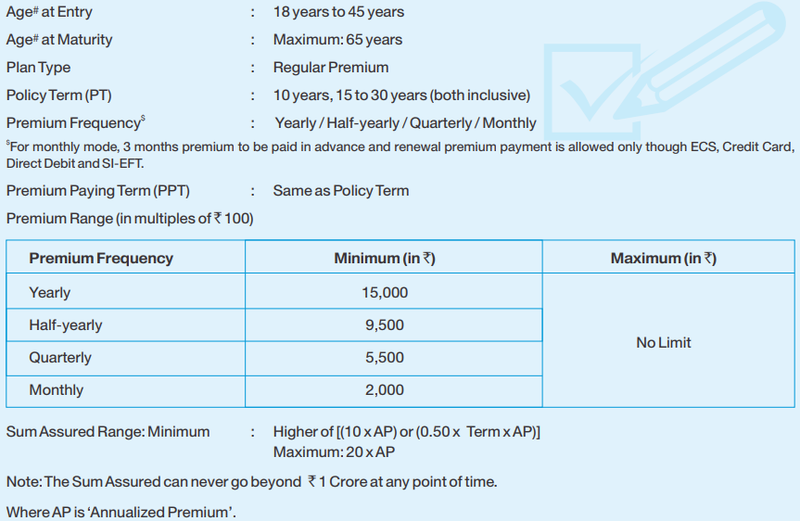 Here, a minimum of 105% of total premiums paid till the time of death. However, in the in-built benefit (Accidental Death and Accidental Total and Permanent Disability or Accident Benefit), there is a provision of an additional benefit for Accidental Death or Accidental TPD. Compare all the ULIP plans available in the market and after thorough research and study, place your precious money on these investment instruments. Read carefully all the terms and conditions related to the policy and choose the best suitable SBI life ULIP policy. Why Choose SBI Life ULIP Plans? The SBI Life ULIP plans serve two purposes. First, it acts as an insurance cover and second, it is one of the best investment instruments. A part of the premium is invested in the money market while the other part of the premium is used as an insurance coverage. This two-in-one policy fulfils your investment appetite in the best possible way. The most important feature this plan provides to its investors is flexibility. Flexible premium and payout options are available under this plan. Tax benefits are provided as per the Section 80C and 10(10D) under the Income Tax Act, 1961. The sum assured will be paid to the nominee in case of death of the insurer. The nominee can claim the amount, if the insured person dies before the maturity period. There is an option to surrender or partially withdraw your ULIP. If the investor wants to withdraw the policy before maturity period, then the plan gives the option to withdraw the plan anytime, subject to few terms and condition. Submitting your documents is the most vital part of investing in any plan. Absence or unavailability of any mandatory document may make you ineligible to invest in these life insurance plans. The processing of investment will begin only after the verification of documents. So, keep your authentic and original documents copy with you to avoid any delay due to unavailability of original documents. Latest bank statement of NRE account as a proof of premium paid. No increase or decrease in premium is allowed under this plan. Any changes in premiums are not advised and allowed under this plan. Why you should opt for SBI Life -Smart Wealth Assure? It is a Unit linked plan that offers wealth maximization through the automatic allocation of premiums for a higher return. 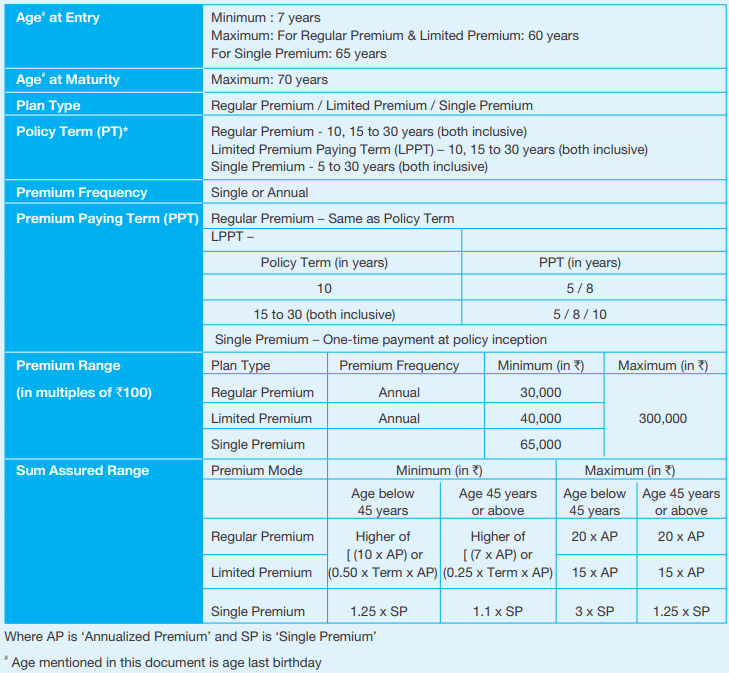 How can I check policy status for SBI Life ULIP Plans? To check the policy status for SBI ULIP plans, login to e-portal enter your customer id, date of birth and policy number i.e. all the details about your policy will be displayed. 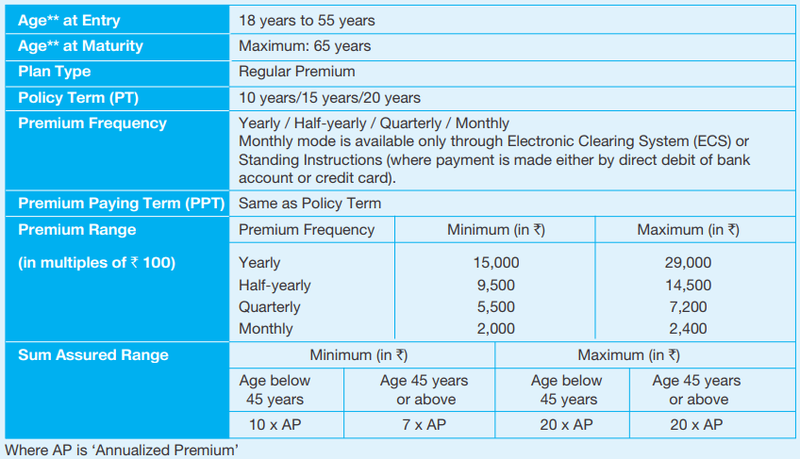 What is the policy renewal process for SBI Life ULIP Plans? What is the company’s process to settle a claim for SBI Life ULIP Plans? The claim will be settled as soon as you submit your documents related to policy in nearby SBI branch and get them verified. What is the policy cancellation process for SBI life ULIP plans? Submit a duly filled surrender form along with documents in nearby SBI branch and after verification, your policy will be cancelled. How does SBI Life ULIP Plans work? SBI ULIP plans comes with variety of attractive benefits and flexibility and gives you ample choice to choose from seven different plans as per your requirements.